Diaries from the First World War provide a fascinating glimpse into the lives of the men who witnessed it first hand. They provide a wealth of incidental information about the day-to-day life of a soldier. William Eve was a Rifleman in the Queen’s Westminster Rifles and kept a diary of his time on active service during 1914 and 1915. You can read more about his story here. 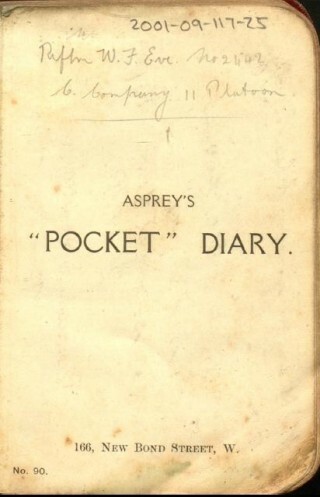 Reproduced here are lightly edited transcriptions from his diaries held by the National Army Museum, Chelsea. Eve’s diary is honest and unsentimental. In November 1914 he writes about having a ‘jolly good time’ and a ‘ripping breakfast of bacon and fried potatoes’. But he also reveals the horror of war in a matter-of-fact manner; ‘one of our fellows shot in the head whilst cleaning his pipe’. Christmas Day. Friday 25 December- At beginning of day respect for Xmas shown. On both sides fellows stood on the parapet & struck matches & shouted across greetings to each other. When it got light everybody strolled about conversed with the Germans, exchanged souvenirs, played football, & not a shot fired all day or night. beautiful day, white frost. This page was added on 28/07/2014.